Althea Thauberger, Preuzmimo Benčić. Photo by Milica Czerny Urban. 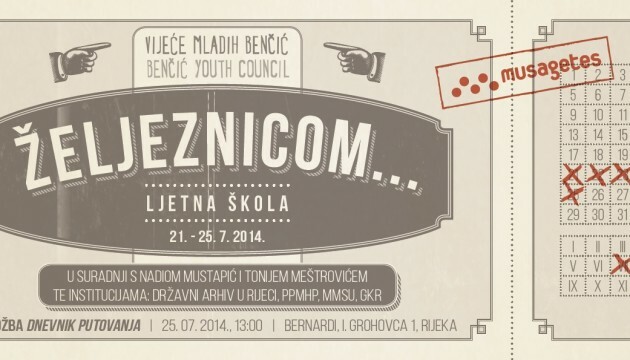 With the summer school “By Railway…” we are opening the first cycle of workshops and activities organized by Benčić Youth Council (BYC). The Council is a group of young Rijekans who learn, influence, create, and experience many forms of art within the city. They discover and debate art and culture. As it is one of the most significant spaces of industrial heritage in the city of Rijeka and the subject of a new Musagetes project developed by artists Nadia Mustapić and Toni Meštrović, Rijeka’s railway will be the focus of the first summer school of the BYC. The main reason for the development of Rijeka’s industry was the railway built in the second half of the 19th century. It connected the mainland to the sea and formed the main trade and transport route from Budapest (Hungary) to Rijeka. At the time, Rijeka was directly ruled by the Hungarian government and financially dependent on it—most of the industry in the city was funded by Hungary. The existing monuments from that era are Rijeka’s main train station (built by Ferenc Pfaff, a famous Hungarian railway architect), and the railway warehouse. Rijeka experienced a golden era regarding industry and economy at that time, and the railway is one of the main reasons for that. The summer school “By Railway…” will last for 5 days and will be based on collaboration between the Benčić Youth Council, local artists Nadia Mustapić and Toni Meštrović, and several institutions: the Archive of the City of Rijeka, the Maritime and History Museum of the Croatian Littoral in Rijeka, the City of Rijeka Museum, the Rijeka City Library, and the Museum of Modern and Contemporary Art Rijeka. The activities will introduce children to the historical and symbolic importance of train transport in Rijeka and will be focused on raising the children’s awareness of the history of the site and the city. The children will take several symbolic railway trips during the project: “By Railway into history” (through fieldwork and workshops in different institutions, the children will learn more about and connect to the history of the railway), “By Railway into culture” (through fieldwork and workshops, the children will have a chance to be introduced to the romanticized and symbolic place that railways and trains take in literature and arts), “By Railway with Nadia and Toni” (children will have a chance to be introduced to a new art project that engages with the rail system developed by Nadia Mustapić and Toni Meštrović, and will have a chance to learn about their work and technique). When people think about the trains at first they see them just as modes of transportation, yet trains and railways also have a strong symbolic presence and are often presented and used as a metaphor in arts and literature. They represent a place where people depart, arrive, accidentally meet, go separate ways, seek adventure, where they reunite or say goodbye. They tell stories about possibilities, progress, and change. We will use the metaphor of the rail system to investigate the history of the site and the city. During all five days of workshops, in the latter part of the day there will be creative workshops based on the idea of developing a sketchbook containing reflections, considerations, research, thoughts, emotions, moments, ephemera, pictures, and ideas. During the fieldwork, the children will collect materials and ideas that will be included in their sketchbooks in the afternoon. On the last day of summer school, the children will prepare an exhibition of their sketchbooks and show us different “railways” they have taken during our five day long trip into the history and symbolism of Rijeka’s railways. Train Circle from Film & Video Art Lab on Vimeo. Train Circle - Making of from Film & Video Art Lab on Vimeo.